A 1936 exhibition of Mrs. Florence Evans Dibble's red and cream-colored Valiant coach-and-four at the Old Orchard Beach Kite Track in Maine. Mrs. Dibble's team set a new coaching record on May 12, 1936, for a 118 mile run from New York to Atlantic City. The team, driven mostly by Mrs Dibble during the journey, finished in a time of 10 hours, 4 minutes and 22 seconds, according to a report in the May 13, 1936 issue of the Lewiston Evening Journal. The recorded time was actual driving time, only, not inclusive of stops to change the teams. The Valiant coach was originally built in France for William Tiffany. According to the April 17, 1936 issue of The Milwaukee Journal, Dibble's four-team hitch was made up of large trotting horses "more suited to coaching than the half hackney type." Dibble used 13 Standardbred horses in the race, changing the team of four out approximately every 20 miles. The winded team was then placed in a van and transported further ahead on the route. 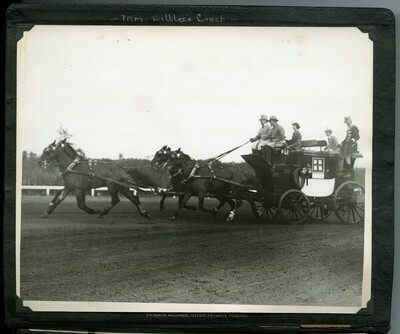 The four lead horses (shown here) set the highest average time of 16.02 miles per hour included Arthur Mower, Calumet Dapper (leaders); Capitol Stock and John R. McElwyn (wheelers), all of whom also had records competing in harness races in Maine. Reports in The New York Times placed the value of the horses at $50,000. The trainer/driver for the trip was Walter Gibbons who mapped and conducted the trip. Dr. William H. Ivens served as the veterinarian overseeing the horses.